Jessica Alba was spotted headed to Jessica Simpson’s baby shower in LA on Saturday afternoon. Despite it appearing to be a sunny day in LA, the actress arrived wearing a dark green safari jacket with leather sleeves. The rest of her look included a simple white tee, a printed scarf and grey leggings. A yellow Kate Spade New York ‘Chambers Street Carlyle’ croc shoulder bag from the Fall 2012 collection and black boots accessorized her look. 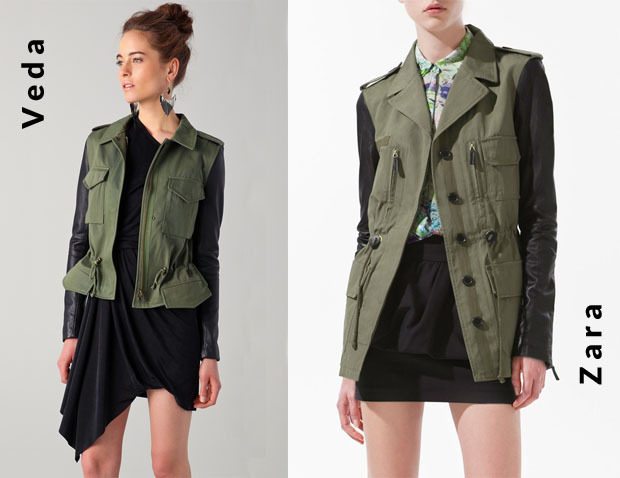 Whilst I couldn’t find the exact jacket Jessica is wearing, I did find two almost identical versions. Veda’s ‘Jasper’ jacket cost $737 (£482) whereas the almost identical version from Zara.com, which is slightly longer, can be purchased for a mere £79.99.